MaintSmart maintenance CMMS software is an enterprise level version of the equipment maintenance software for use in small to very large multi-location equipment maintenance operations. Grab Your Free Software Trial! Equipment failure tracking tracking and analysis. All modules included. Nothing extra to buy later. Export all data immediately to to Excel, Adobe Acrobat, Web Page, MS Word. Built-in query-builder and chart-builder for all data all screens. Powerful role-based permission so all user can access the PM software at some level. Windows PC or Cloud with web-based work request module. Print and email scheduler for most report, all PMs and work order. Contact us for a free personalized demonstration. How are others using the maintenance software? Contact us for competitive pricing. The work order module offers very simple work orders (2 fields) to very comprehensive work orders with unlimited file attachments, up to 2 GB of text instructions and extensive parts lists; and everything in between. The maintenance planner configures all work order field data to fit the maintenance operation. First of all, duplicating work orders speeds work flow and add consistency. Secondly work order templates offer a way to use a boiler-plate work order to generate new work orders manually, by meter or by schedule. 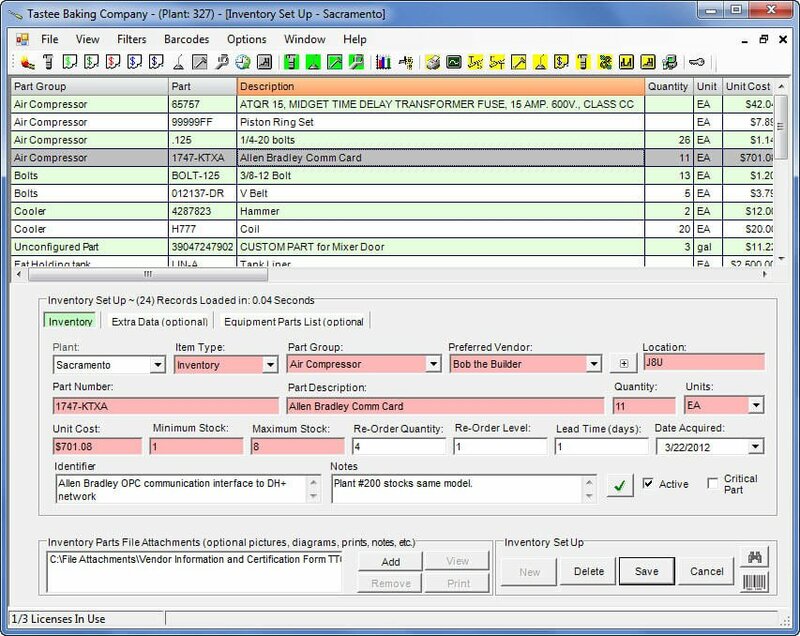 The exclusive work order approval system optionally adds a layer of compliance verification to the maintenance CMMS software. Likewise the work order status change logging system tracks the progress of the work order through it's life cycle. Best of all, work order status change logging ties into the event notification system. Specifically, emails are sent to appropriate users as the work order status changes. Linking meters from equipment on the plant floor (through OPC network) has the equipment telling the software when it needs work with the program automatically generating a work order in response. In summary, this work order software system automates, issues and verifies your maintenance work flow through a series of automated and semi-automated steps. Manage preventive maintenance in either the full work order module or the unique preventive maintenance (PM) module. Quickly update and close many calendar-based PMs from the preventive maintenance module. This PM software is the only PM software that has this powerful and simple to use interface. Furthermore, preventive maintenance tasks regenerate automatically with a new start and due date after closing the PM. Additionally, set user permissions on mechanics so that they only see and can close their own PMs. In short, our PM management solution speeds up the maintenance process through automated regeneration of the task list. Our PM software archives each closed preventive maintenance task. The logged data includes: who did the work, labor hours, parts used and if the PM was completed on time or not. Subsequently, this useful historical data guides the maintenance planner with scheduling, personnel assignments and downtime prevention planning. Additionally, there are a few shortcuts in the PM software such as Use Average Completion Time and Close on Due Date that make closing many PMs simple and fast (that is if user has permissions to use these features). If your organization is looking to buy preventive maintenance software consider the fact that MaintSmart is the only preventive maintenance software solution that offer a separate calendar-based PM software system. 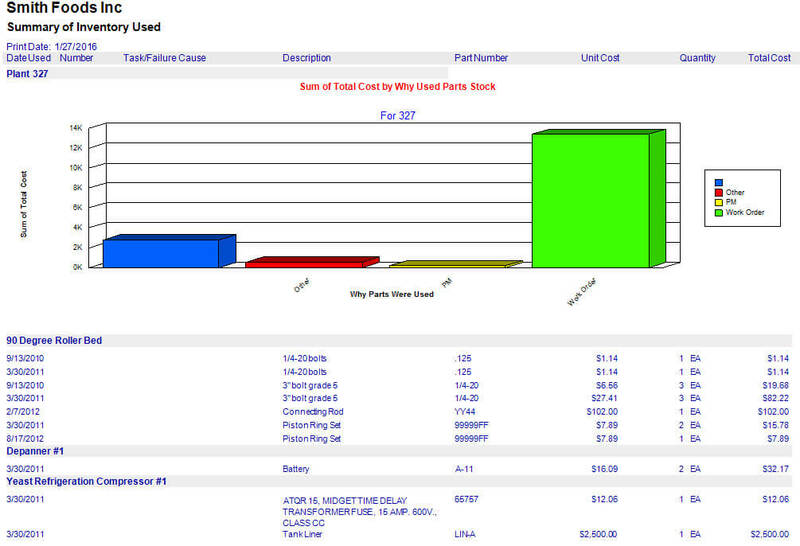 No other maintenance CMMS software package has a dedicated equipment failure tracking software module. Our system tracks down time separately from work orders. Since machine downtime is not an instance of work it only makes sense to track downtime separately. In other words, downtime is an instance of equipment failure. As such, it must be separated from the work (repair work order) that is generated in response to the downtime. That being said, MaintSmart generates a corresponding repair work order automatically to address the down time instance. By tracking equipment failures in this manner the equipment maintenance software module is capable of reliability analysis, OEE and suggesting preventive maintenance task intervals based upon MTBF. Introduction #1 to Equipment Maintenance Software. Introductory Maintenance CMMS Software Training Video. Introduction #2 to Maintenance CMMS Software. Introductory PM Software Training Video. Introduction #3 to Machine Maintenance Software. Introductory preventive maintenance CMMS software training video. Inventory management provides a comprehensive set of tools to manage audits, minimum stock reordering and many reports. First of all, data in the inventory module of the PM software exports to Excel with two (2) button-clicks. 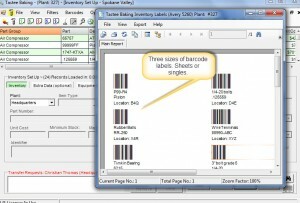 The benefit here is obvious, as Excel is a great tool for large lists of inventory data. Attach any type of file as a file attachment to spare parts as needed. Additionally, link spare parts to work orders, preventive maintenance, down time or simply to the equipment item itself. Furthermore, the system automatically uses spares when a work order is closed or a PM is created. 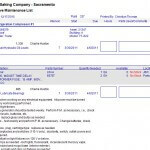 Moreover, link spares directly to equipment items to create a parts list for that equipment. Spare parts inventory is typically a large database of records. 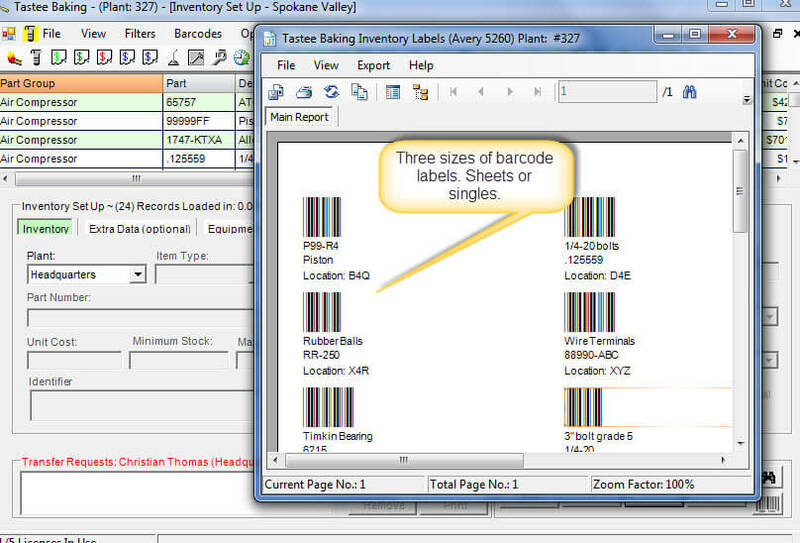 As such, it really makes sense to have a powerful and flexible search capability with inventory data stores. There are several ways to search inventory with our software solution. For example, find the word "bolt" anywhere in the spares listing. Results are returned in seconds even when the database contains 10's of thousands of parts records! NEW: Cloud-based machine maintenance software version 5.0 implements inventory usage management in addition work order management, downtime logging and preventive maintenance management. 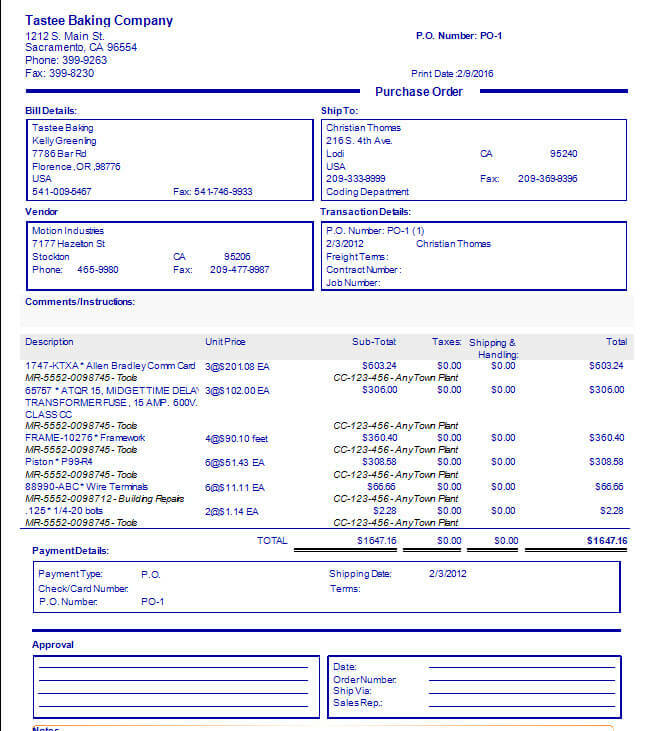 The purchase order management software module rivals ERP systems costing many times the cost of this entire PM software package. Most importantly, extensive and flexible role-based permissions create a secure purchasing environment or alternatively one person can possess enough permissions to perform all purchasing functions. 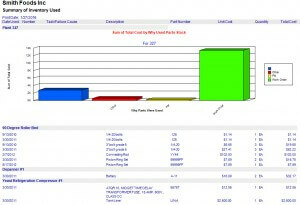 The result is, our CMMS provides a way for all users to access the purchasing system at some level. For example, some users can create a purchase requisition. Alternatively, another user can approve requisitioned items up to $1500 (for example). The point is, the administrator assigned all of these various roles and permissions based upon the actual needs of the company. This leads to a flexible system that works for your organization! Purchased items immediately become available in inventory when received. Also, as purchased items are received raw inventory levels adjust automatically. Similarly if purchased items are returned to the vendor the item quantity decrement as expected. Best of all, management of the inventory database is completely automated as spares are used too. 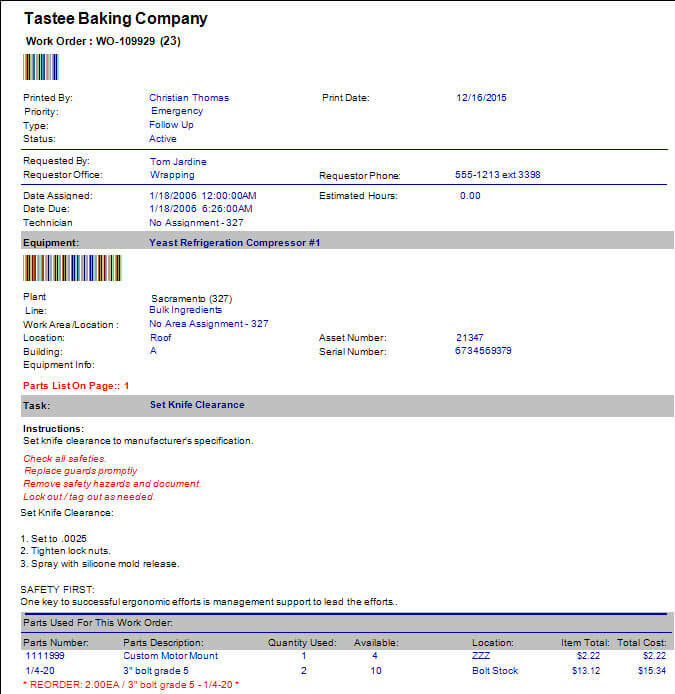 If your company is looking to buy equipment asset maintenance software consider the fact that this software has a full purchasing system included in the base module. Track all costs associated with equipment from all sources. Report in multiple common formats: Acrobat, Crystal Reports, Web Page, MS Excel, MS Word and more. The reliability analysis module yield powerful MTBF (mean time between failure) and failure rate. Failure Rate: how often and what percentage is the chance of failure over a specified time period. Overall equipment effectiveness (OEE) is yet another powerful KPI found only in MaintSmart equipment maintenance software. OEE: Performance * Availability * Quality. Do you want to find and correct problems quickly and save time and money? No other CMMS can do what MaintSmart does with identifying equipment failure issues. Grab your free 30 day trial period of the full CMMS package. Free training during trial period. Request a free consultation. data import also available. There are five different work order formats. Typically a work order consists of one primary task and one equipment item. Work orders may have parts lists details and file attachments of any type linked to them. The files that are attached will automatically print with the work order without any user action. 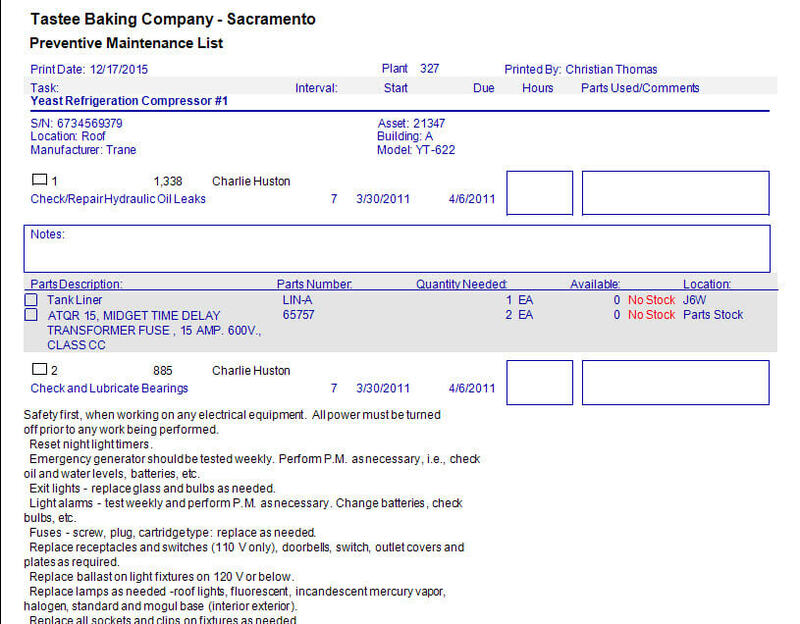 Preventive maintenance task lists usually contain many tasks and equipment items. Each equipment/task record may be linked to unlimited text details and parts lists. Parts are automatically used from stock when the PM is closed or simply displayed on the PM list depending upon the user setting.